An annoying popup ad has been reported in October 2017. The ad uses the address lp.amazinggiftnowforu.bid. 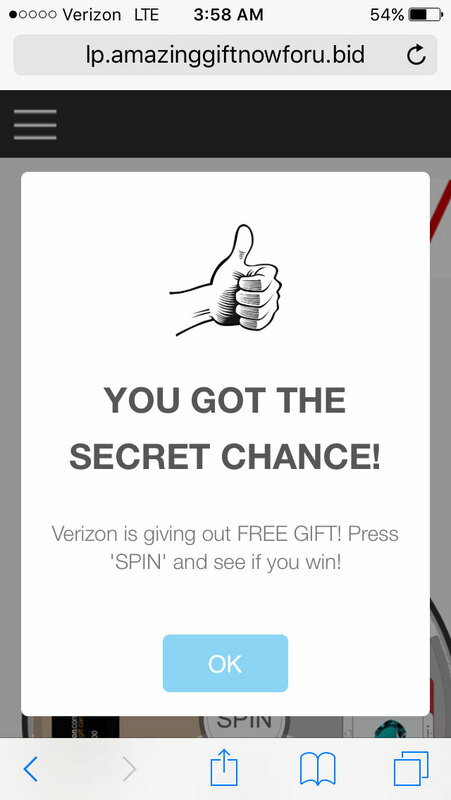 When a website is loaded the browser was redirected to a page with an ad (scam) regarding Verizon giving away prizes. The domain name of the page was suspicious. "YOU GOT THE SECRET CHANCE! Verizon is giving out FREE GIFT! Press 'SPIN' and see if you win!" DO NOT touch this ad, and avoid accidental touching of this ad. Close the window. This website contacted 1 IPs in 1 countries across 1 domains to perform 1 HTTP transactions. Of those, 0 were HTTPS (0 %) and 0% were IPv6. The main IP is 52.202.131.162, located in Ashburn, United States and belongs to AMAZON-AES - Amazon.com, Inc., US. In total, 0 B of data was transfered (sic), which is 0 B uncompressed. It took 0.395 seconds to load this page. 0 cookies were set, and 0 messages to the console were logged. Note: This information has NOT been verified.